Despite sensationalist media, Cancun remains the top vacation spot! According to Airlines Reporting Corp, Americans keep flying to Cancun in spite of a wave of safety concern warnings for this vacation season. The second place in that list has become Orlando because of it’s park and attractions, leaving New York in the third place of the most booked destinations by Americans. This is telling as it shows the sensationalist media hasn’t dissuaded most people from traveling and having a great time in this Caribbean Paradise. Cancun is one of the most popular vacation spots in the world, and is specially popular with Americans as it stands only at 2 hours away from Florida, though there are many direct flights from other parts of the States. Cancun receives over 3 million people per year, and while crime rate has increased in the downtown, touristic areas like the Hotel Zone are incredibly safe for visitors. Remember that the goal of sensationalist media is to keep you stressed and alert… make you feel scared so you have the need to stay informed for your safety, information that they are just so happy to provide to you, with the facts they have specially picked to keep eliciting this response. Even then, thousands of people break through that conditioning and seek what really makes them happy. For some people is just traveling and relaxing in the beach, but for our patients, it’s the ability of smiling again. 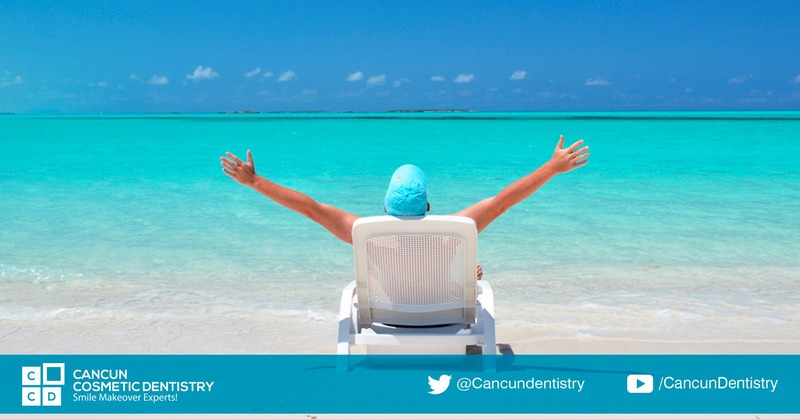 Our dentists in Cancun are ready to help you out with any dental problem you may have. We are located in a popular shopping mall just 5 minutes from the Hotel Zone’s entrance, surrounded by department stores and close to cinemas. You won’t have to worry about anything! Returning patient is happy with his dental work!